Nortek Electronics Ltd was approached by a large Automotive Customer who suggested an Electronic Product for use within a passenger vehicle. 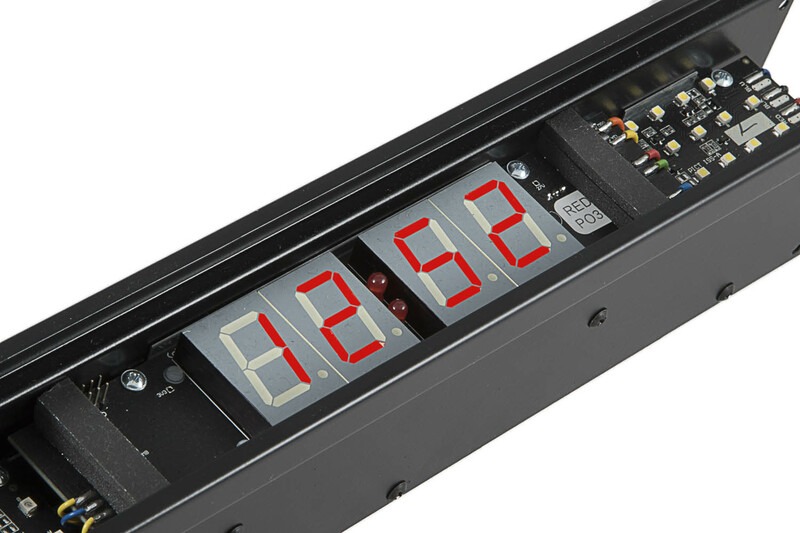 The Product was a large digital clock, along with switchable illuminated custom decals which would serve to convey either mandatory, safety or courtesy information to the passengers traveling in the vehicle. 2) The Clock Display would only illuminate when the vehicle engine was running, with only minimal current consumption from the vehicle battery when the vehicle was idle in order to maintain the time. 3) Two custom illuminated decals, which could be illuminated either independently or together with each decal being controlled by an external signal either provided by a conventional switch or external electronic device. 5) The Clock and Decals to be easily readable in sunlight. 8) The Clock Time to be maintained internally during any loss of the GPS signal, such as the vehicle traveling through a tunnel or whilst inside a ferry. 9) The completed unit to meet all relevant legislation(s) in relation to furnishings and materials installed inside a passenger carrying vehicle. With the criteria now clearly laid out, Engineers from Nortek Electronics, began working on the design. Consisting of Three PCB’s, a modular, interconnected system was developed within a robust metal chassis which would contain a main control pcb, responsible for decoding the time from the GPS signal and controlling the clock time during periods where the GPS was lost. In order to make the unit as compact as possible, this PCB also contained the power supply and drive circuitry for each of the two illuminated decals. The GPS Module utilised within this design was a fully qualified, and extensively tested unit sourced from a large American Manufacturer. With the customer requirement for the decals to be illuminated by a maintenance free light source, a “cluster tile” of long life LED’s manufactured by OSRAM were employed as the background light source, which would give both the reliability and intensity which the overall design and environment demanded. Several sources of 1 inch high blue & red LCD displays were tested, until a device was found that gave the required sunlight readable output, and of which could be read clearly from several meters away, and the entire front display are was protected by high quality toughened glass. Using its extensive, worldwide supply chain, Nortek Electronics Ltd engaged the services of a professional silk screen printing company who, themselves, had over forty years’ experience in printing artwork and graphic logo’s onto a variety of materials. Working in full consultation with the end customer, we finally found the combination of material, colour and artwork which gave the exact result which our customer was looking for, which in this case, consisted of a decal which would advise passengers within the vehicle to fasten their safety belt, with the second decal serving to give courtesy information as to when the vehicle W.C was occupied. However these decals can be produced to any requirement. During the development of the unit, our customer returned with an additional requirement for incorporation into the design. Given that the vehicle was to travel across Europe, and perhaps span two or three different time zones, the customer had decided to further the features of the unit by requesting that the time displayed by the GPS clock, changed automatically in relation to the time zone in which the vehicle and its passengers were currently located. 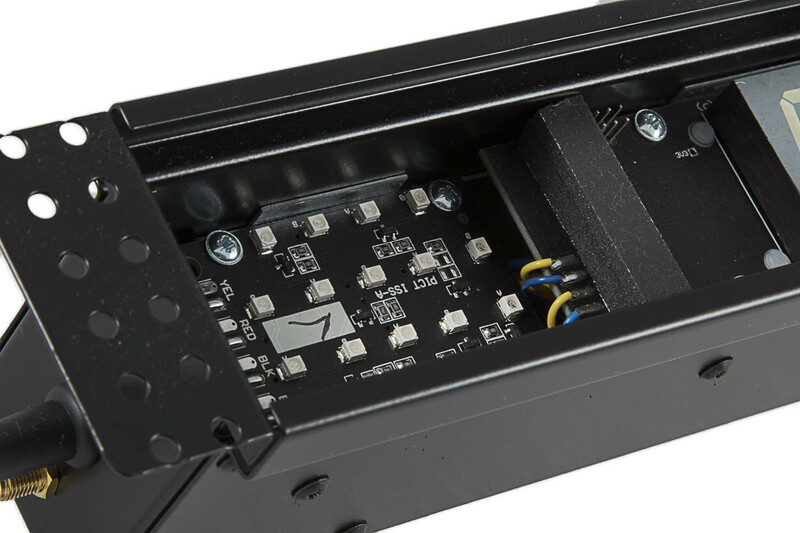 Not phased by these eleventh hour changes, our engineers redeveloped the custom software to incorporate this requirement, without any major changes to the overall design or the PCB. Multiple mounting holes were drilled into the brackets to enable the unit to be fitted in any location, and various angles. The customer was happy to not only get a product which met the full criteria of their original requirements, but now had access to a product costing below their original budget and since Nortek manufactured the product as their own, there were no expensive R&D costs levied to the customer either. Thanks to the modular and flexible nature of both the hardware and software within the design, Nortek Electronics Ltd is able to customise the design to illuminate any custom printed logo on the decals, and both the colour of the decal illumination and the actual clock display can be supplied to each individual requirement upon request. There is also a decal only option available too, for those who want passenger signalling facilities, but without the GPS clock. Please contact us for more information on purchasing this product, customised to your own requirements.